Watercolour landscape artist Mervyn Rubuntja will be travelling to Sydney from Alice Springs for a weekend of events in Sydney in February, which include a painting session at a local gallery and a panel discussion at the State Library of NSW on the life of Albert Namitjira. 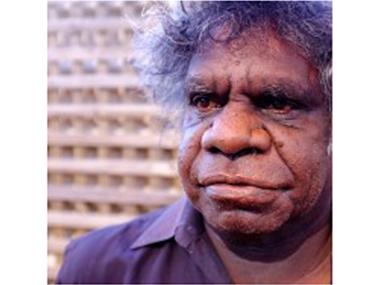 Mervyn Rubuntja was born at the Telegraph Station in Alice Springs in 1958. His father, Wenton Rubuntja Pengate, was an important Lawman and respected member of his community who worked hard for Aboriginal rights and the protection of the land with the Central Land Council and with his involvement with the Mabo Agreement. Taught to paint by Albert Namatjira (a relation by skin group), Wenton was also a well-known artist, and subject & co-author of the book, And the Town Grew Up Dancing. When Mervyn turned 13, his family moved to Hermannsburg where he first saw watercolour paintings being created by his uncles (Albert Namatjira’s sons, Maurice, Oscar and Keith). It was here he was then given watercolour paperboard and told to paint, with Basil Rantji teaching him how to mix colours. 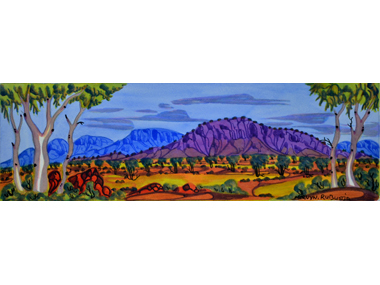 Since then, Mervyn has developed a distinctive style in painting the landscapes of Mt Riddick, Mt Leichhardt, MacDonnell Ranges and views around Alice Springs, with a clear and vivid colouring. His paintings are in many collections including the Museum and Art Gallery of NT, Araluen Galleries and Ian Viner QC, and have been accepted into the 2007 and 2008 NATSIAAs.